Once again, we skip over our stock of used Les Pauls, PRS and Strats to showcase two vintage “budget beauties” we’ve got in the store right now. These two archtop acoustics are just so strikingly beautiful: the Harmony Monterey in classic sunburst and the Silvertone in a gorgeous tobacco burst. 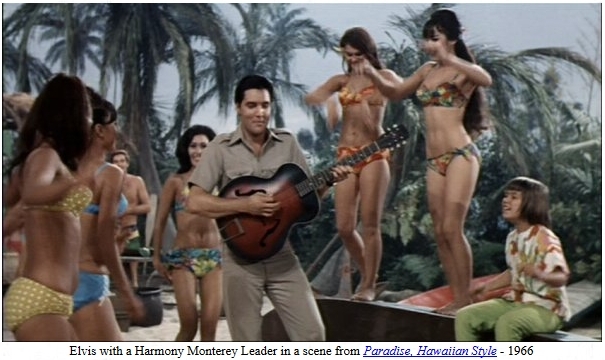 Before you sneer at the brand names on the headstocks, just remember that the King of Rock and Roll even played a Monterey…and he was surrounded by girls in bikinis! Harmonys and Silvertones were marketed toward students and shoppers of department stores. Both brands were most likely made at the same Harmony factory and then branded for different stores. ESSENTIAL BLUES MACHINES: Their plywood and birch construction makes perfect gumbo tones for blues. Blues legend, Buddy Guy has used an old Harmony archtop on his albums, Sweet Tea and Blues Singer. We love vintage…and budget at Guitars on George. Stop on down and take a few guitars for a test drive today. And if you have a unique or off-the-wall guitar you’d like to sell, bring it in!